You can find many Australian Outback Pictures all through this website (together with lots of information about Australian Outback travel), but they are small. I wanted to show some bigger photos. 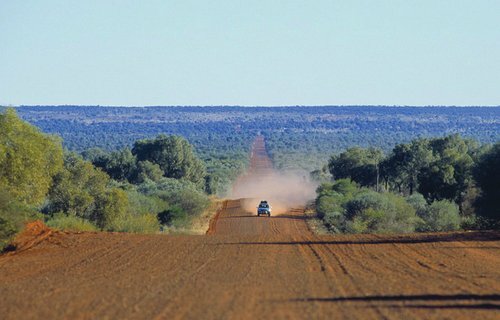 So I went through all my photos and selected the best Outback pictures to create this photo gallery. 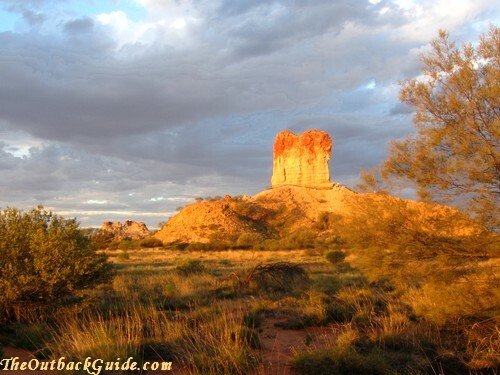 These pictures of the Australian Outback are grouped by location or theme. 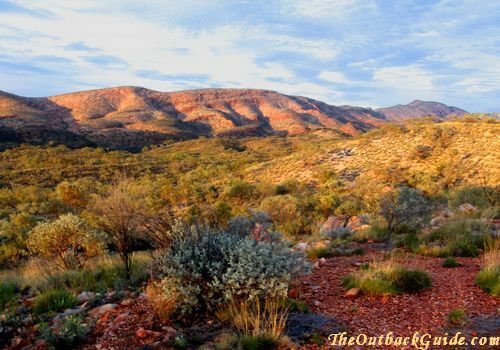 You can choose any of the links below, or follow the link at the bottom of each page to view the whole Outback photo gallery. Australian Outback I: the Red Centre. Australian Outback II: the North West. Australia Outback III: the North West after the wet season. Coober Pedy: as dry as it gets. 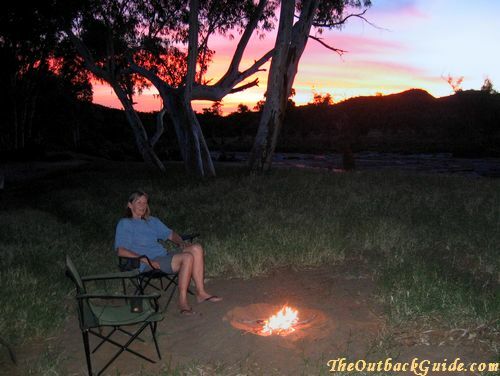 What do you think of first when you hear "Australian Outback"? Endless horizons? Red sand? Red rocks? Remoteness, solitude, and sleeping under a million stars? This place south east of Alice Springs has it all. The rock is called Chambers Pillar, and it's much closer to a real Outback experience than Uluru will ever get. This is what driving across the Australian Outback looks like a lot of times: an endless ribbon of red dirt, snaking towards an endless horizon, and big dust clouds announcing any oncoming traffic. Actually, this is one of the few dirt roads left in this very touristy region south west of Alice Springs. 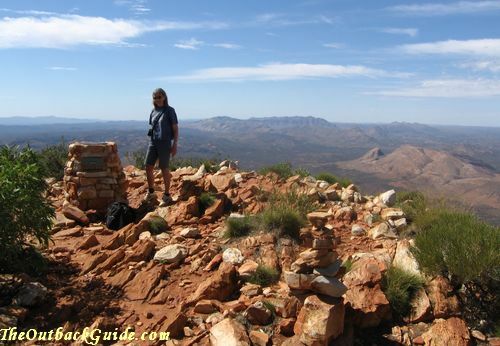 It's the Mereenie Loop Road that connects the West MacDonnell Ranges with Kings Canyon and Ayers Rock. 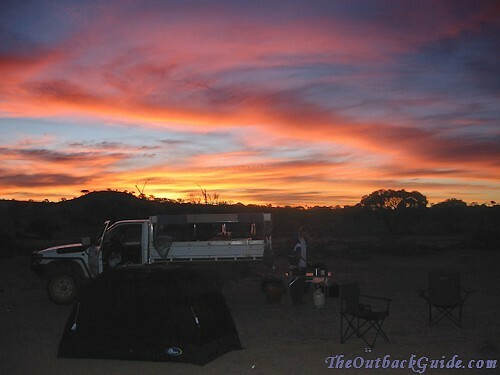 I took this Outback picture when camping in the MacDonnell Ranges, just a few seconds before the sun completely disappeared.. This Outback photo was taken the next day, on top of one of the highest points of the ranges. I don't think many people think of hiking as an Outback activity, but to me it's the only way to see the place properly. 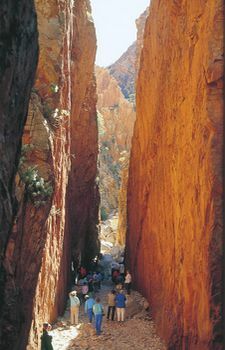 Wherever there are ranges in Australia you will find chasms and gorges. 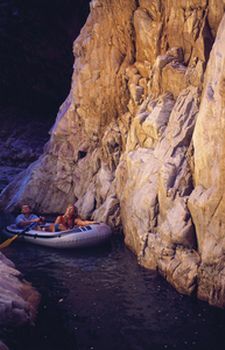 Some are dry and just offer spectacular views and scenery, but many have permanent waterholes at the bottom. I guess swimming is another activity that's not always immediately associated with the Aussie Outback... Yes, we go swimming a lot! And we go camping in the Outback. A lot!